When you schedule a meeting in the desktop or web app, you use the Invite people box to search for and invite people. Then, you can use the scheduling assistant to see times when everyone is free. When you're in a meeting, you can see the people who were invited but haven't joined. To send someone a reminder to join the meeting, click on their profile picture and choose Call in to the meeting. 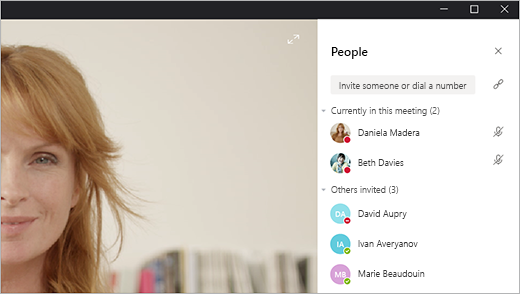 If you're in a meeting, you can also click Add people to add someone who was previously not invited. When you schedule a meeting in the desktop or web app, you use the Invite people box to search for and invite people. Then, you can use the schedule assistant to see times when everyone is free. When you're in a meeting, you can see the people who were invited but haven't joined. To send someone a reminder to join the meeting, tap their profile picture and choose Call in to the meeting. If you're in a meeting, you can also tap Add people to add someone who was previously not invited.